Back in 1969, as a penniless student, l lusted after a better form of transport than the Puch 175 split-single I had just passed my test on. My uncle had a Matchless G80 which I greatly admired, but wasn’t available to me. I quickly looked for a similar machine, and being young and headstrong bought the first bike I saw, a 1955 AJS Model 20. This machine was no looker with its rough paintwork and Avon handlebar fairing, neither was it a mechanical gem as it smoked heavily and leaked oil like the Torrey Canyon (readers of a certain age will remember this oil tanker sinking in the 60s). However it had three great attributes: it was local, it ran, and it was cheap. I parted with my £15 and was the proud owner of 42 XVT. Rough as it was, that bike was my sole means of transport for the next couple of years and as long as I kept filling it with oil, my mantra at the time was ‘oil’s cheap, engines are dear’. It never let me down and took me everywhere I wanted to go. 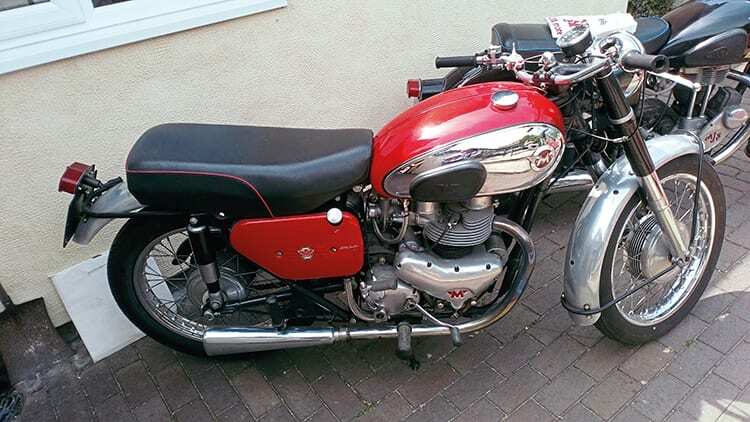 Two years into work and I was persuaded to buy a very tidy BSA C25 and sold the Ajay on. I sold it for spares or repair as a 200-mile journey would empty the oil-tank and the dynamo no longer performed its electrickery! I picked up the £10 note and never expected to see the bike again. Fast forward to 1995 and my youngest son Darren, who now proudly owns a 650csr, came home from school and asked me if I had ever owned an AJS, registration number 42 XVT, as his form teacher now owned it and wondered if I was the same Ian Massey as the name in the log book? If so would I like to see it or even possibly buy it back. Intrigued, I went to look at a bike that was a time warp for me. It looked exactly how I had remembered it, and then I heard its story. Apparently, the guy I sold it to fixed the charging problem and continued to use it as his everyday transport until a change of job forced a move from Stoke-on-Trent to Newcastle-upon-Tyne, so the machine was duly ridden to Newcastle and continued to be his daily transport. Eventually he sold it to a young trainee teacher who would become Darren’s form master, but who would first of all take up a post in Bath, riding the bike there and using it to commute to work every day, again without any major problems and no serious repairs. Eventually the bike succumbed to its years as said teacher took up a post in Stoke-on-Trent and rode the old girl up from Bath, running out of oil at Hilton Park services and seizing the engine solid. This was how I viewed it, lying forlornly at the back of his garage waiting for someone to restore it. We didn’t agree on a price and I never saw the bike again, I hope someone did buy it and give it the care it deserved, but I think the bike was a testimony to the quality of AMC machines and the capable nature of that sweet 500cc engine. I’ve never owned another 500 twin, despite over the years owning just about every other model in the post-war AMC range, but when penning this short tale, by total coincidence, I was offered a rather nice looking G9. Call it fate!? Follow Classic Bike Guide on Social Media! Want more of Classic Bike Guide? Then like us on Facebook!